It takes a village to raise a kid and some basic questions (or better said answers) to know which type of bow case you’d need for a bow. You can’t go shopping for a bow case without first knowing… which type of bow you have. You’re excused if you’re looking for a gift and you need to find out the type of bow, but it’s not something to be brag around if you’re buying it for your very own bow. There are plenty of bows out there and the bow cases also differ. A target compound bow is not the same as a hunting compound and the first is not going to fit in just any case. You may find cases for takedown recurves, for longbows and also for traditional recurves. So, pay attention to what you have in the first place. Are you planning to travel a lot with the bow case or not? In addition, when we say travel, we actually mean: are you going to take it in the cushioned back seat of your car or you plan to put in the bouncy back of your track, on the way to the hunting spot? 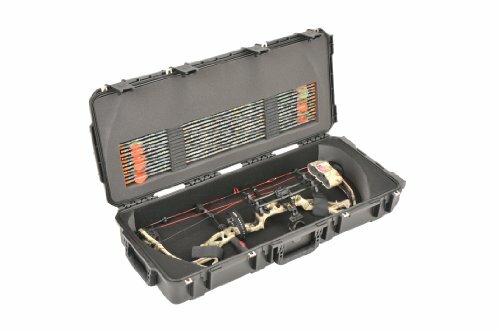 Do you plan to store your bow in the bow case? Are there going to be any kids or curious pets around the bow case? Things like that have a lot to say on how portable/durable your bow case needs to be. The durability of the bow case brings us to another important matter: would you rather get a soft case or a hard case for your bow? Hard cases are more durable, but they bring also more weight and typically are bigger. If you want a lightweight case, the soft case is the obvious choice but keep in mind it doesn’t offer the strongest protection to your bow. If none of these options suits you, you can always go with a hybrid case that is in fact a soft case with some rigid foam built in. It’s not as rugged as the hard case, but it offers more protection than a regular soft case. Keep in mind that if you also like flying with your bow, you need a bow case that is “airline grade” or something related to that. It’s a lockable bow case and you can definitely take when not flying also (unless you have more than one, in which you can let do what you like). We should have started with this one: how many things do you want to put in your bow case anyway? When you need the bow case for your bow, arrows, and all the things you need to shoot…you definitely need to go big or go home. A bow case may be as simple as you want or created for the OCD type, with plenty of pockets, straps and everything to keep everything in place, well organized. Either way, just figure out first what you need the bow case for. Apart from the fact, you need it for your bow. Are you the simple kind of shooter that doesn’t like to get complicated with the multiple organizing pockets? If so, the Mossy Oak Compound Bow Case is definitely your kind of bow case as it offers what you like the most: simplicity. The bow case is highly versatile more than anything else as it’s one size fits most. So, don’t care that much about the size, as the case sure accommodates almost any type of bow. However, it’s not only versatility that this bag has for you. It’s made so that is able to protect your bows and accessories when you put them away for storage and even when you carry them around. The bow case is durable and can take the most difficult conditions, despite its looks. The zip works smoothly and keeps all the accessories you together. This is definitely a bare bone case, but its large size sure makes out for it. the bow case does have a good build and is highly functional. If you like, the freedom on the move, the case is a great choice for you. It’s lightweight, flexible and very easy to carry around. The Mossy Oak Break-Up Infinity with Black Trim sure makes a great impression also and fits the durability of the bow case. Even though it comes with some flaws, we really like the bow case for what it is: a flexible, functional, lightweight bow case easy to take out in the field. There’s no fun in going shopping on a fixed budget, but you can sure find what you need without spending too much money. After all, your bow case shouldn’t be more expensive than you bow, right? if you find yourself fitting in the picture, give it a go with the Plano Protector Compact Bow Case. We’re pretty sure the bow case didn’t become a very popular choice only for its low price, but also for the good things it brings also. 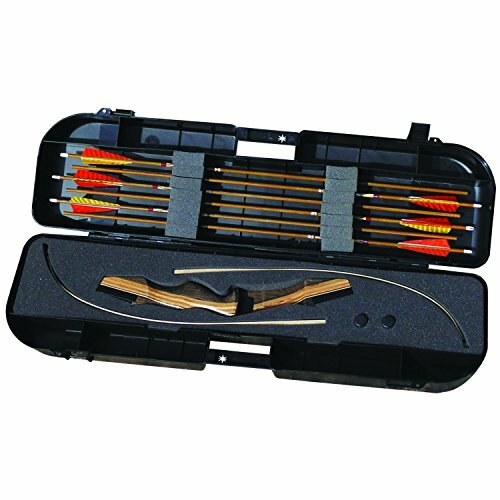 The compact bow case comes with high-density foam and is able to protect your bow and the few accessories you may fit in. The foam is pretty thick and is an important quality of the bow case. The bow case offers not only well padded protection, but also keeps safe inside the bow due to its patented pillar lock system. The strong clips are actually one of the best features of the bow case. When it comes to versatility, we need to mention the bow case fits most parallel limb bows. It presents enough space to store your arrows in the lid also. The bow case brings a simple design and the setup takes you less than 5 minutes. The Velcro straps are an important touch and the four latches really close tightly the case. The small compact size make the bow case great for storage/travel and you may even take it when flying. As it’s lightweight and sturdy altogether, we’d say the bow case is a great choice for any fixed budget. All in all, for quite a good price, we’d say you end up with a small, compact, pretty dependable bow case for your bow and the few arrows that fit in. We all like well-made things, especially when they come at a very good price. 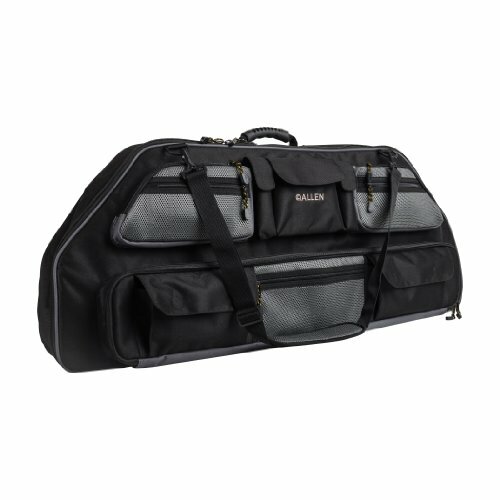 The Allen Gear Fit X Compound Bow Case sure fits the bill and is made to accommodate your gear, in a very organized way. There are many features we really like on the bow case and we start we the 10 accessory pockets that keep your small items well organized. We also notice the soft interior lining that protects pretty nice your bow, that shouldn’t be bigger than 38 inches. Not only the bow case keeps your accessories organized, but it also offers plenty of space for them. The interior tie-down straps keep the bow into place, so you don’t have to worry about its safety when carrying it around. We also like a lot the portability of the bow case and, along the typical, comfortable rubber carry handle, the bow case comes with a removable shoulder strap. The strap is also well padded, which increases your comfort on the way. Sophisticated and well thought out, the bow case is a fun choice also. Some of the pockets have magnetic fasteners for easy open and close, whereas others come with zippers. The bow case even has a Velcro pocket. We don’t say this often, but we also like the looks of the bow case. The black and grey combination sure create a sharp look for it. The soft case is well made, lightweight and has so many things to offer. We like the bow case for its pockets, nice details, comfort on the use and, why not, it’s nice appearance. 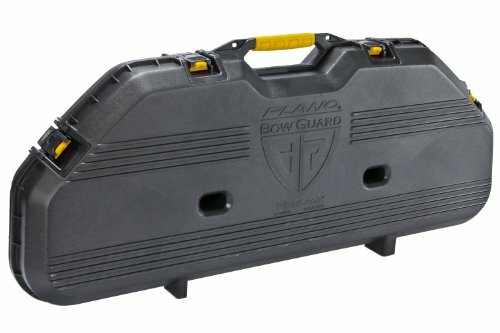 When you think you are ready for a long lasting bow case, get yourself the Plano 108115 AW Bow Case Black. The bow case presents many great features and we don’t really know what to begin with. We definitely like it for the large space that offers for storage and the locks that keep everything safe and secure. The bow case is a great choice for fully loaded in-line or offset quivers. It features dual stage, spring-loaded lockable latches with padlock tabs. The very strong pinned hinges add more security to keep everything in place. When it comes to storage, we notice the elastomeric arrow storage that may store both standard and carbon fiber arrows. In addition, for more versatility, the additional accessory tie-down strap gives you more storage options. The bow case sure has a strong build and takes the most challenging conditions. The rubberized seal ensures case when in water, but the case is also air and dust resistant. The secure holding straps for strings and limbs doesn’t let the bow shift when carried around. Easy to use and with great possibilities for customization, the bow case is a strong option that you should try. It’s a bombproof option that may seem a bit pricey to some, but it’s totally worth it. Apart from the minor flaws, when in need for a durable, tough, large and heavy-duty bow case, this one is a sure buy. If you are willing to pay the extra buck for a bow case that is just right for your smaller parallel limb bows, give it a try with the SKB Injection-Molded Small Parallel Limb Bow Case. They even got it in pink color. The bow case is in fact a Military-Standard Injection molded case that is not only watertight and dustproof, but it’s also made in our USA. It’s impossible not to like the plush lined EPS interior that gives safe positioning and padding for your bow. The arrow storage in lid is large and may accommodate up to a dozen arrows. The 12 slots for arrows sure save organization problems. The compact bow case lets you customize it also as it features reinforced padlock locations for your own locks. 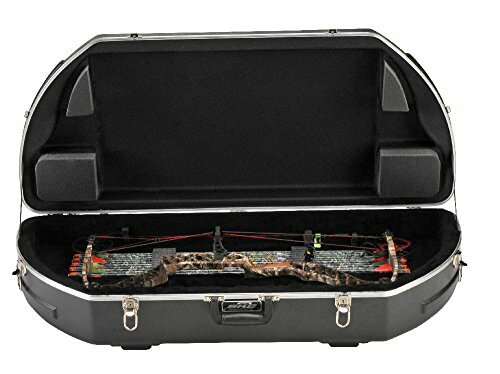 The professional-grade bow case has a great build and a compact size. It’s a high quality options and the wheels on the end sure are functional in so many situations. Very well built and with so much space for storage, the bow case is truly a bombproof case you should get. 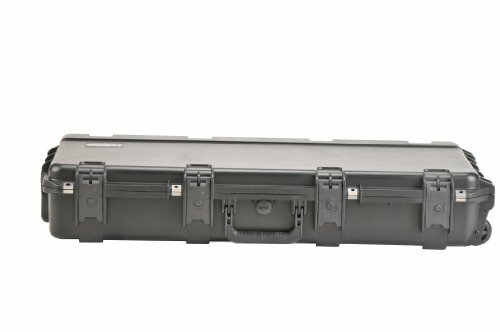 Nevertheless, for the durability, the quality and the large storage space it offers, the SKB Injection Molded bow case is a sure option any given day. When your mind is set on a compound bow case, don’t hesitate to give it a try with the Superline44: Compound Bow Case and Backpack. You may like its appearance at first as the bow case sure looks stylish, but there’s more to it than looks. 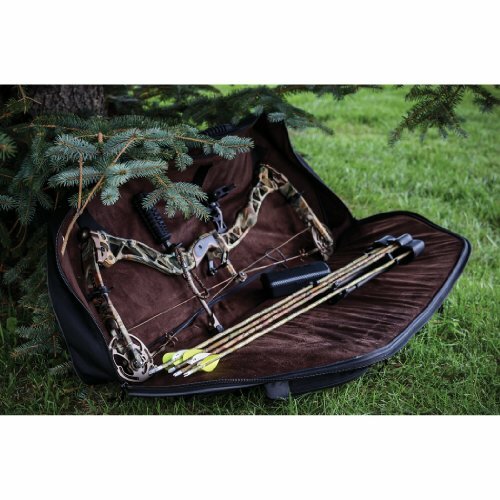 The case fits compound bow up to 41” ATA and ensures safe storage and easy carry all the time. 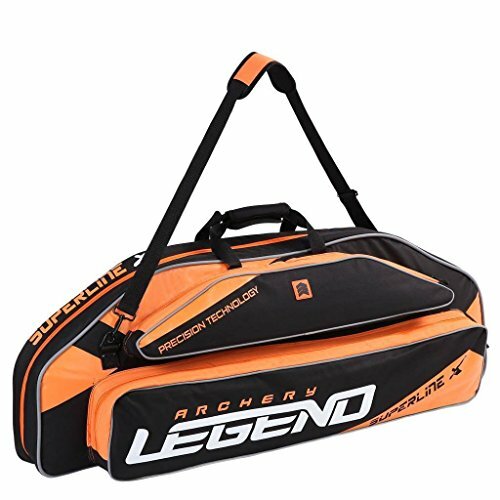 The high-impact compound bow case is made with very good quality materials and the shock absorbing foam sure protects your bow. The 360 degrees expanded foam padded case is very protective with your gear, which should count the most when getting a bow case. When we go through the details, we also see the arrows box pocket, the inside mesh pockets that store many of your archery accessories. The oversized long lasting nylon zippers make the bow case highly functional and increase its durability. We like a lot not only the several options for organizing the small items, but also the portability of the case. The carry handle is just one of the options, as the bow case also features a shoulder strap for easier traveling. You can use it also as a backpack, which sure gives you plenty of freedom on the move. The inside lining in soft tricot fabric, the thick foam padding mean your gear is always protected in the case. The buckles and amp are made of string metal that takes the intense use, whereas the rivets feature Legend padded cam pockets. The bow case has a good build and gives plenty of storage so it’s very little to not to be satisfied with. You may even choose from black green and black orange combinations, if looks also matter to you a lot. We’re able to see the bigger picture though and we really enjoy what we see: a long lasting, versatile, portable bow case that protects and organizes your gear! Some like the tough, heavy weight bow case; some would always go with a soft bow case. When you fall down in this category, get off the fence already and take a shot with the Allen Gear Fit Pro Compound Bow Case. First thing to know about the bow case is that it may accommodate most bows up to 35” axle to axle. 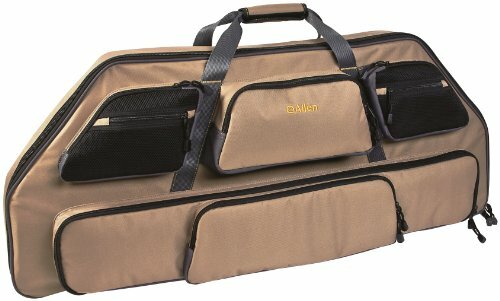 The Allen Gear Fit Pro is not the type of bow cases that doesn’t offer plenty of organizing options. On the contrary, the bow case features no less than 7 specially designed pockets. You have no excuses not to organize your gear anymore. The versatility and efficiency of the bow case are sure something to talk about and the bow case stores arrows, box wax, targets, broad heads and various items that you might want to have when hunting. The closer look shows us two large mesh pockets, two small mesh pockets, two central pockets for the medium-sized items and the nice arrow pouch. The pouch may fit arrow boxes 33” long by 5” wide. It’s very easy to open the pouch, winning some extra time. We also need to talk about the portability of the bow case. The padded handle grip and the shoulder strap not only make it easy for any of us to carry it around, but it also ensures nice comfort when carrying it. Important feature to mention alert! The easy-to-grab zipper pulls help you get your gear fast and easy, in a nick of time every time! Along with all these functional details, comes the long lasting build of the bow case. Its endure exterior is tightly woven and the heavy-duty polyester takes the intense use, for so many years. The heavy-duty bow case is reliable and very well made and its look could seal the deal for many of us. All things considered, we still like a lot the bow case and we sure recommend it as a long lasting, heavy-duty soft bow case. First time you see the Vista Traveler Takedown Case, you don’t really trust its abilities, but don’t let the looks mislead you! The bow case is actually a great option for storage and travel as it protects and offers enough space storage for multiple accessories and, obviously, your bow. The bow case is a hard case and you can definitely take it when flying. It’s built for takedown recurve bows and holds up to 18 arrows (not longer than 34” though) and fits bows up to 62”. We like the bow case as it’s well thought out so you can fit plenty of accessories, protecting them just as well. The internal gear storage is in fact very well organized and helps you keep in order your tab/glove/string/arm string. The extra pockets along the outer edge are a nice detail just as well. The bow case has a small compact size, which makes it easy to store and to carry around. It’s lightweight, but tough enough to protect the bow. It has a solid build and it features high quality foam padding and a rugged shell. The lockable snap closures are efficient and the build in broad head wrench is useful. The case is also s weather resistant so this is also important to keep in mind. Small, tough and protective, the bow case is a great choice for the takedown recurve bows. Despite the minimal issues, we think the bow case is a great, compact, well thought out hard case for the takedown recurve bows. When it comes to getting a compound hard case, you can sure find plenty of options. The trick is to find one that can be tough without the extra weight that typically comes with a hard case. 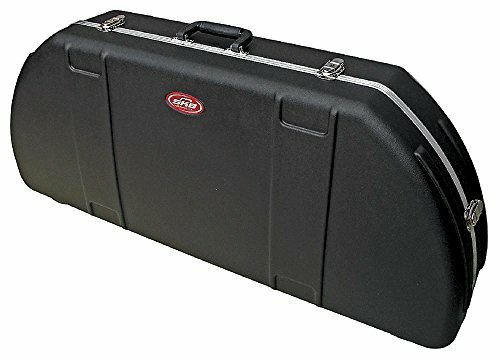 The SKB Hunter Series Bow Case falls into this category and manages to bring the heavy-duty build, without actually adding the heavy weight. 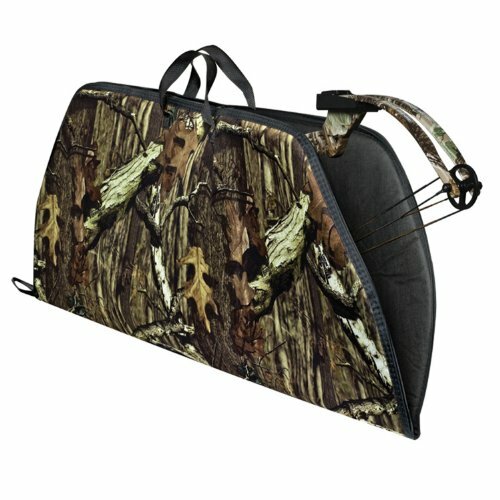 The bow case is made to fit most of the popular selling bows out there with the quiver attached. The rigid shaped ABS shell sure protects your compound bow and the little details are also functional. For instance, the stylish embossing adds structural support to the lid, due to the eight point interlocking stacking system. You don’t need to worry about the protective abilities of the bow case that manages to keep safe and secure your bow. The case’s build keeps at distance dirt, dust and moisture. Sure enough, the lockable draw-bolt metal latches increase the safety of your gear. We also notice the plush lined EPS inserts that ensure high impact resistance. The new state of the art water-jet cut polyethylene foam arrow system is important to mention too. The portability of the bow case is reliable and the carrying handle brings comfort when on the move. The refined hardware, the good quality plastic, the rugged build complete the description of the bow case. You sure get the image of a rugged, dependable bow case that fits most parallel limb bows with quiver attached and many more. 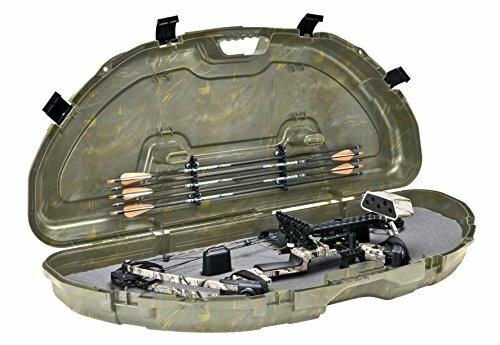 All things considered, we think the bow case is a reliable choice when in need for a compound bow hard case.